The AmazonBasics Microwave is the first voice-controlled microwave I’ve ever seen and as lazy people we endorse this new product. What can the AmazonBasics Microwave do? Coming from Amazon expect tight Alexa integration in this device. You require an Echo device for the voice functionality to work (not included) and when you do it’s as simple as pressing the associated button on the microwave and asking it what you want to heat up or defrost. Alternatively, you can call Alexa to wake up your Echo and start your microwave from your couch. In most cases you dont’t have to worry or think about duration, power or modes. Just say ‘reheat this cup of coffee’ and the Alexa integration will pick the right settings for you. Or you can just use basic commands like ‘microwave for 2 minutes’ or ‘stop the microwave’. There’s also an automatic reorder of popcorn when you’re running low on your stock, powered by Amazon Dash. With an Echo device (not included), quick-cook voice presets and a simplified keypad let you just ask Alexa to start microwaving. 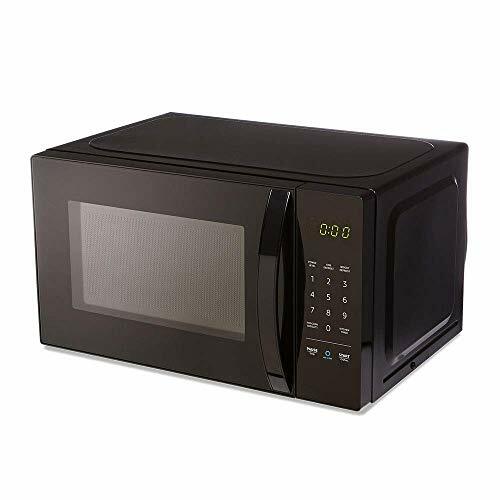 All in all this is a very decent microwave for the price (around sixty bucks at the time of writing), we bet you can’t find any other voice-controlled microwave for this price. We’re curious to see what kind of device Amazon will add to their AmazonBasics next!